Disclaimer: I was sent this as a recommendation by Simon&Schuster. Joe is instantly drawn to Guinevere Beck after she steps into his bookstore. He can't stop thinking about her and wanting to see her, and it seems Beck is falling her his charms. Yet, she doesn't realise the extent to which Joe will go to have her and Beck isn't exactly what he thinks she's like. Their relationship becomes a dangerous game, and the consequences are deadly. I wasn't exactly sure what I was in for when I started You, but what I got I can't say I loved. In fact, even thinking about it now makes me feel disturbed and uncomfortable. 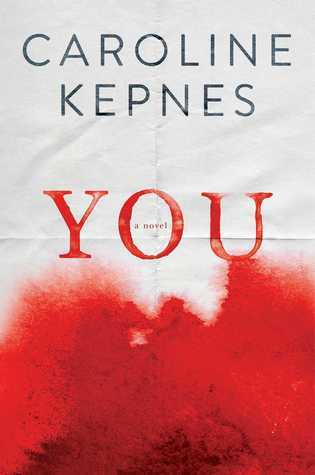 You is a thriller at its best, but whether its the right thriller for me is the question. Of course being a story about a stalker means that it'll have elements of creepiness and socially unacceptable behaviours. However, whilst the story progressed I really had to think about whether this was a thriller with highly explicit content or eroticism hiding underneath the genre thriller. That's the part I did not like, and which put me off the entire novel. Maybe I'm just a prude, but I felt like the sexual aspect was so crude and drastic. Still, Kepnes' writing really conveyed Joe's obsessive nature in a really interesting way. Readers are placed in his situation, and that's why it seems so much more logical, even though we know what he's doing is wrong. It can be easy to sympathise with him for feeling anxious, happy and anger only because we know how it feels to like someone. However, at the end I still didn't excuse his actions only because his infatuation led to dangerous and disturbing things. I would've liked to know why he grew up to be like he was, because he didn't seem to be lacking in any area. He could attract a girl just by looking at her, was funny, smart and well-read, so it's not like he would find it difficult to get a girlfriend. I hated every other character, including Beck, only because they were all so flawed yet, acted like they owned the world. This is such a realistic interpretation of people though, and Joe's observations of Beck's personality really came across as issues that nearly everyone actually has to deal with - although not to that extreme extent. At some point I started to feel like the novel was just dragging out. I mean I got it - Joe's a stalker, and Beck's not perfect, and maybe they just deserve each other. I couldn't reach the ending fast enough, and whilst there were some surprising moments, I just really wanted the entire thing to end. I wouldn't say I never expected the ending, only because it is a thriller so hello. I felt like the ending was realistic enough so I'll take it as it is, but yeah. I've seen some really positive reviews for You, so maybe whilst I'm a fan of crime, thriller just isn't for me. Or maybe You is on a whole other level of thriller. Either way I just couldn't tell myself I really liked this. I do think it's definitely for mature readers, especially with the explicit content and language. Check it out and see what you think!